Mobile Market will be at Woodside Village every Wednesday from 3 to 5 p.m. through Feb. 27. 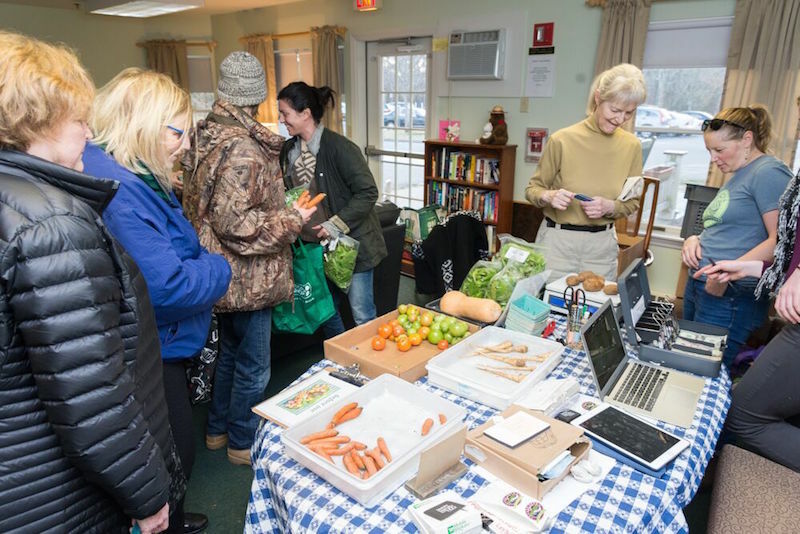 Customers lined up for locally-grown vegetables and eggs at Woodside Village Wednesday afternoon, when the Island Grown Mobile Market made its first winter stop at the Island Elderly Housing complex on the Edgartown-Vineyard Haven Road. By 4 p.m., an hour after it opened, the sales table in the community room was depleted of everything but winter squash, some loose potatoes and tomatoes, three or four wrinkled parsnips and a few cartons of Morning Glory Farm eggs in a cooler. 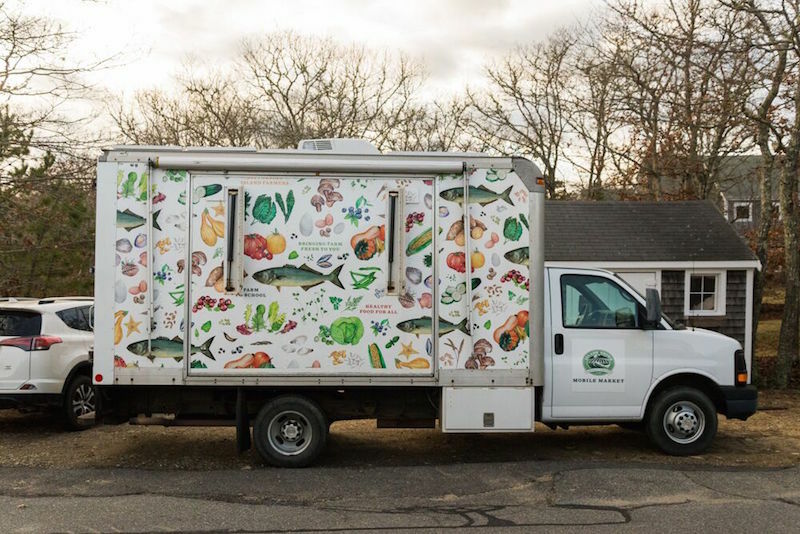 “We just got blown out of the water,” said Sophie Abrams Mazza, who manages the Island Grown food equity and recovery program. Ms. Abrams Mazza and Ms. Ambrose were taken by surprise by the level of demand. Last year an Island Grown vegetable delivery service had attracted only a dozen Woodside Village residents. Some twice that number, including both Woodside apartment dwellers as well as residents of other Island neighborhoods, turned out for this week’s visit, which repeats Wednesdays from 3 to 5 p.m. through Feb. 27. Ms. McCarthy filled her bag nonetheless, purchasing three types of winter squash: acorn, butternut and a cheery orange variety called Sunshine. “Maybe I’ll make soup,” she said. Reflecting a desire for convenience, the first vegetables to sell out this week were the easiest to prepare: pea shoots, cherry tomatoes and bags of salad mix. Carrots and beets also went quickly. Ms. Abrams Mazza said that at present, for permitting reasons, the Mobile Market can only sell whole vegetables, eggs and honey. Island Grown is working on a way to offer customers prepared foods as well, such as cut and peeled squash, she said. Wednesday’s sales were brisk in part because recipients of the Supplemental Nutrition Assistance Program (SNAP, formerly known as food stamps) receive an instant dollar-for-dollar credit when buying local produce under the Healthy Incentives Program (HIP), which runs through the end of February. One snafu the Island Grown team faced Wednesday was a technical difficulty with processing SNAP payments, which slowed the line. Customers were patient, however, and many were charmed by Ms. Abrams Mazza’s six-month-old son as she held him and wrote sales receipts at the same time. 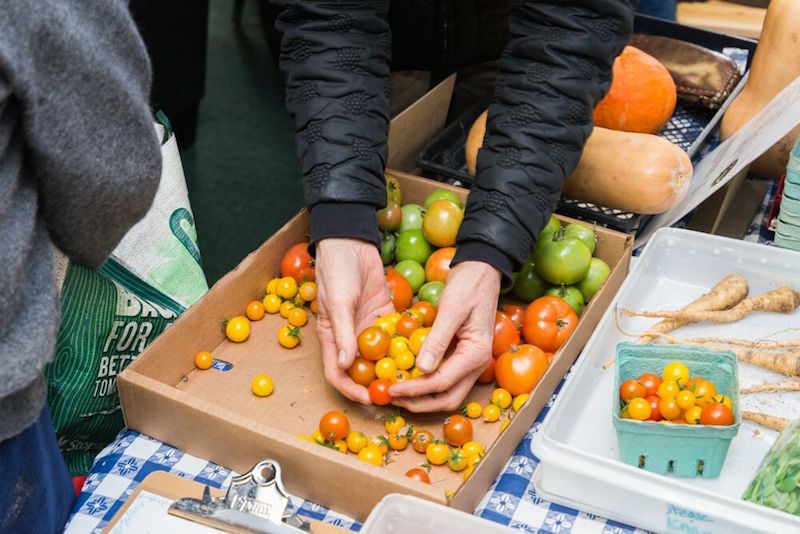 Now that she has a better idea of what customers want, Ms. Abrams Mazza vowed to bring more produce from Thimble Farm greenhouses and local farms to Woodside next Wednesday. “We’ll be ready,” she said.